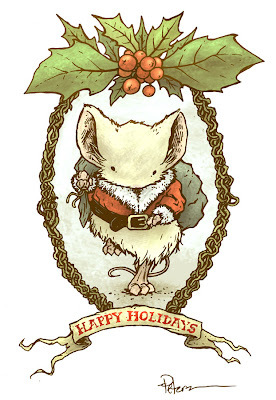 On the Heels of 2011: Busy week with holidays, gatherings, friends, family, and deadlines looming. So I'll share some past work I've done. Black Axe #3 is currently in previews (order code DEC100735) And since I was so late getting the full cover art to you last time, I wanted to share this much sooner. The mead-hall design is one that I spoke about at the end of my model video. 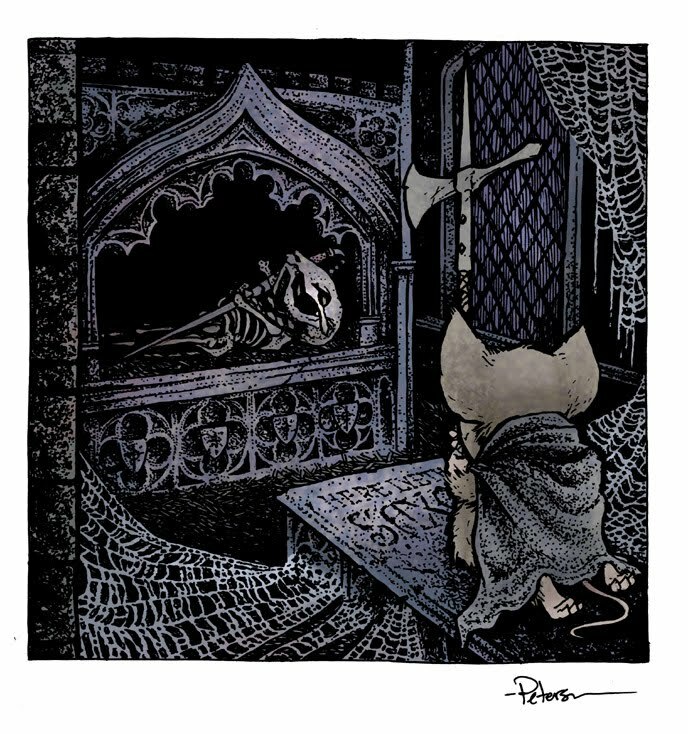 I tried illustrating a design after looking at Norse architecture, photos of real mead halls, and design work from Alan Lee and other folks with regard to fantasy illustration. None of my drawings made it very far, so I felt a model was necessary. So far, this is my favorite Black Axe cover, and it was fun to revisit the Ferret King's designs that I established back in 2009 for the Black Axe promo print given away at my SDCC panel. 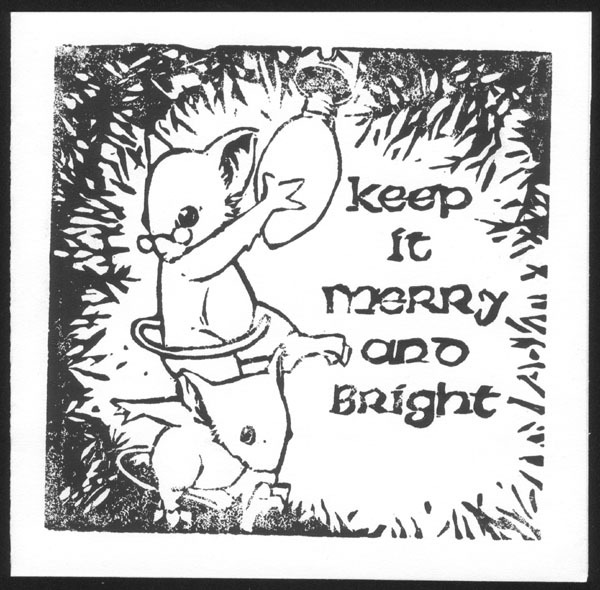 When I found that lino-cut Christmas card I shared last week, I also found a hand drawn card that Jesse Glenn (real life Kenzie) gave me from back when I was 15 or so. Jess is mocking my enthusiasm and drive to barrel ahead on projects without fully understanding how massive they are. We did a great deal of mini-movie making (though we tended to do a lot of pre-production work and then stall out) so the caricature of me is juggling a hot melt glue gun, a puppet head, a welding torch, a tin-woodsman leg, spraypaint and the video camera. Fan Art: Sasha sent this sculpture she did of Saxon. I don't know what her materials are, but she did include this not in the email: "I've never actually said it, because I hate doing the shreeky fan-girl thing, but that's exactly what I am - a fan. I love your work and attached is my version of fan art. Hope you like it. " I do indeed like it Sasha. Thank you! R. Mark Ygona sent this to me saying: "I've been enjoying Mouse Guard thus far and wanted to contribute a piece of Fan Art to show my appreciation for the series. 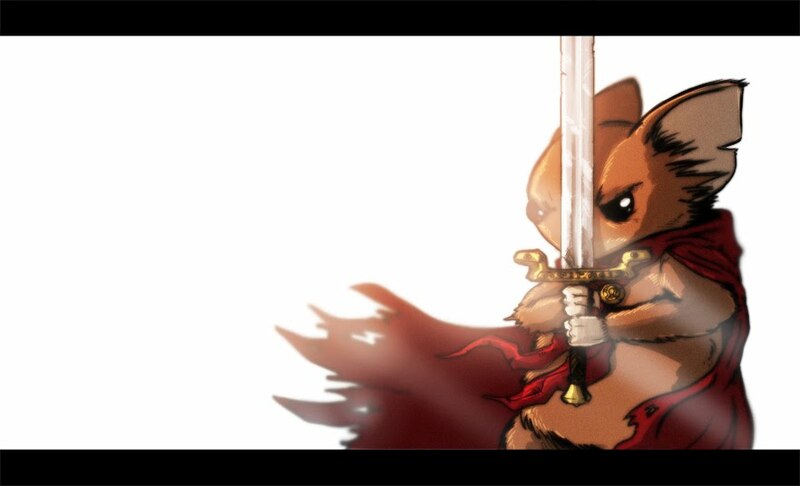 Attached is my rendition of Lieam wielding the Black Axe in action. " 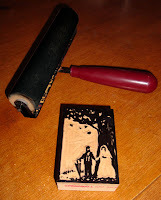 It has been a long time ince I last talked about printmaking techniques (see etching post here) and I wanted to share the process on a gift I gave to Julia for our wedding anniversary back in October. 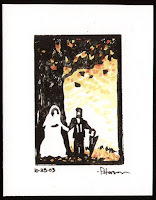 We took wedding photos in the leaves at a park near the church, and I decided to do a small lino-cut print of that moment from our special day. 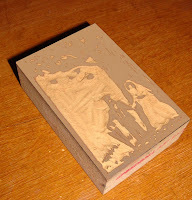 Woodblocks and linolium blocks cane be carved to do a type of print called a relief print. Unlike etching, where the ink goes under the surface of the plate to make the image, in relief printing the ink sits on the surface of the block. 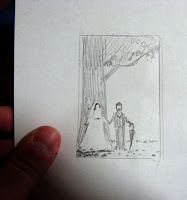 I stared by doing a drawing the same size as my lino block (2" x 3"). It is hard to achive grey tones in relief printing when working at such a small scale, so my design theory was to play just with black and white and have each of us visable by what surrounded us. The white of Julia's dress would be defined by the tree behind her, and the black of my suit would stand out against an open sky area. It was fun to think soley in these terms again, like a 2D design class first assignment. The next step was to transfer the image to the block. Using a soft lead pencil, I coated the back of my drawing. I then placed the drawing on the block (graphite coated side-down) and then retraced my lines with a ball point pen. When the paper is removed, the places the ball point pen applied preasure transfered the graphite from the back of the paper to the surface of the block. Next comes the carving. Because ultimately it's the ink sitting on the surface of the block that will form the image, I need to carve away just the areas that are to be white. 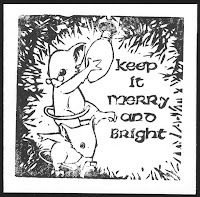 It's a complete oposite of most etching techniques as with relief printing you are actively working on the negative spaces and the areas you don't want to print. Using a brayer (think of it as a printmaker's inky rolling pin) I coated the surface of the finished block with 'ink' (in this case acrylic paint). 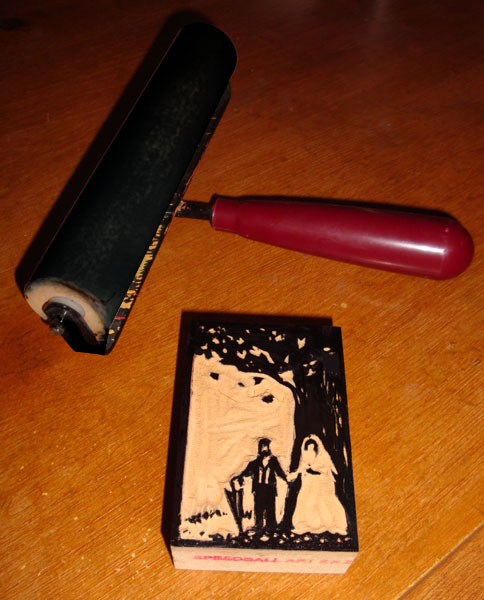 Because the brayer is straight accross, it will not get ink down into the carved portions of the block, but apply it only to the surface. A sheet of paper is placed on the block surface and then rubbed with a spoon. The spoon applies the preassure needed to make sure the ink transfers to the paper evenly. 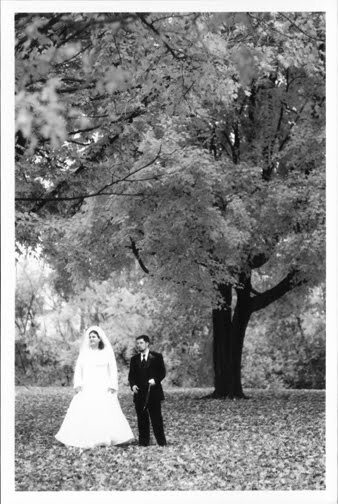 I hand colored the final print to add the fall color that was so much a part of our Wedding Day. Good to note that the printed image is the mirror of the original block (true with etching as well). 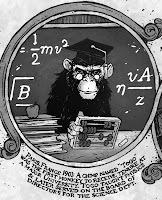 David Petersen: Karl, I discovered your work through your web comic The Abominable Charles Christopher, but you have a wider audience through your work for DC like the Flash for Wednesday Comics. 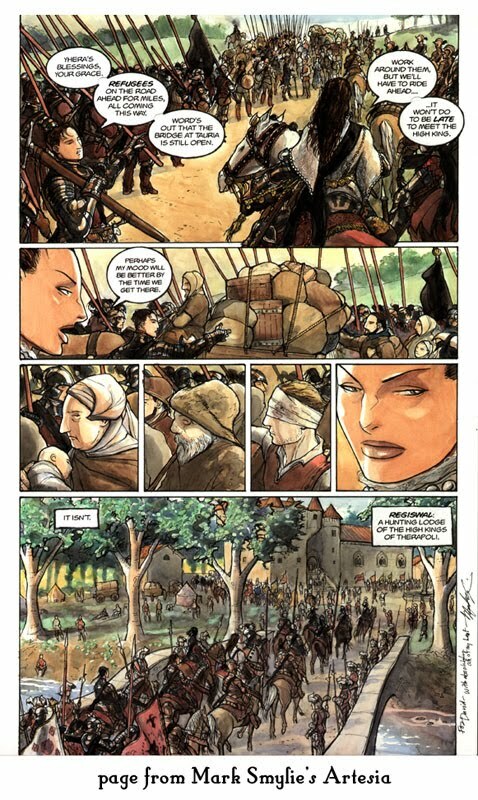 Was working on a Legends of the Guard story more like the work-for-hire jobs or more like your creator owned strip? or was it somewhere between? Karl Kerschl: I guess it was somewhere in between. It's strange, but I rarely think of drawing comics (of any sort) as 'work'. That's not to say that it isn't difficult, or that I sometimes wouldn't rather be doing something else, but rather that each story requires some investment of my energy in a way that's more social than laborious. In order to craft a convincing story, the characters require personal attention; if I don't treat them as real beings then they won't feel real to anyone else. So in the case of the 'Legends' story, my part in it was really just to spend some time with Sadie and see what she was interested in. Superman or The Flash or Charles Christopher all require the same kind of attention. They just have different personalities. David: I set out a few rules for the creators, and one was to not use existing main characters in their legend stories. 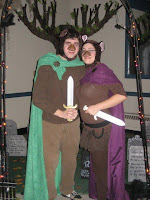 You asked to use Sadie and showed me how the story wouldn’t upset any continuity plans I have with her as a character. What was it about Sadie that drew you to a tale of hers? 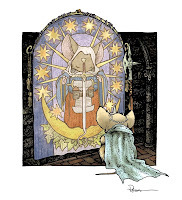 Karl: When I was reading through the Mouse Guard books I found myself constantly wondering about Sadie's state of mind whenever she was in the scene. She's very quiet. She's obviously brave and capable, but there's something beneath the surface of her character that always seems to be asking a question, and I was interested in what that question might be. I thought of her as a very reflective, almost meditative character and it occurred to me that her time in Frostic, in complete isolation, might have been an important time for her, spiritually. David: When discussing the project you mentioned Northern Ontario being inspiration for the setting. Is there any place in particular? 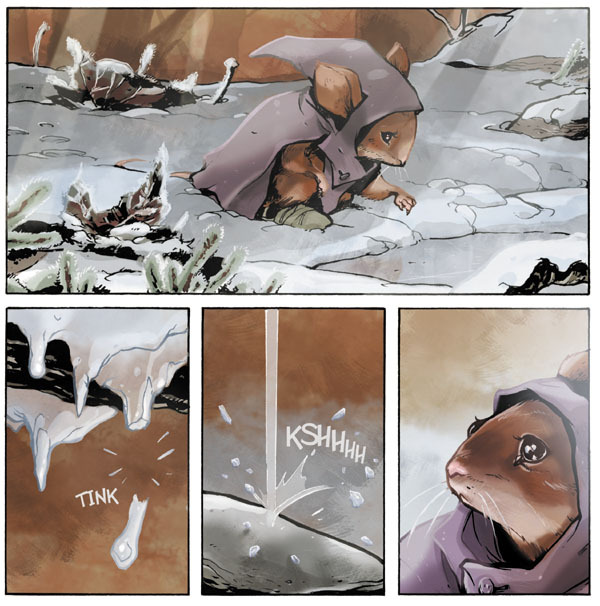 It also feels like the same woods that Charles Christopher tromps around in...did you set your webstrip there too? Karl: Not consciously, but I'm sure it influences most of my woodland settings. I grew up in Southern Ontario - almost as far south as one can get in Canada - and it was a rural area with a forest behind the house where we would go for long walks. My family also spent a lot of time up north at my uncle's cottage, and it's one of my favourite settings, geographically speaking. I love the rocky Canadian Shield coasts and the mossy forests. David: The story you described to me on the phone went into Sadie’s feelings, mental state, motivations, etc....however, the story ended up being wordless (other than sound effects). Why did you feel the story worked better this way (and I think it does!)? Karl: We talked about adding narration of some sort, but I don't think it would have played very well. The idea was really to accentuate the loneliness and quietude of Sadie's time at the Frostic outpost and to suggest that perhaps that extended period of solitude had affected her state of mind - cleared here head, so to speak. Adding words would have amounted to mental chatter, which is in direct opposition to the meditative state I was hoping to convey. I also like the way the sounds of nature build to a crescendo with the rumbling of the caribou herd, and adding narration to those moments would have been redundant. Daivd: Speaking of sound, what do you listen to while working? music? audiobooks? your studio mates? podcasts? Karl: When I'm writing, or just trying to imagine scenes, which is basically the same as writing, I listen to a lot of soundtrack music from films. Anything wordless, really. Unless I have a very specific emotional idea in mind for the scene, for which I'll play appropriate lyrical songs. Sigur Ros and Aimee Mann got a lot of play for some of the scenes in The Abominable Charles Christopher. The 'Legends' story was all about ambient music. I liked listening to 'Joga' by Bjork because of all the cracking ice sounds. When I'm just inking or colouring and I don't need to concentrate on mood, I listen to podcasts. Mostly tech and video game news. David: As for process, how did you take your story idea and pace it into your 5 pages? Karl: I think 5 pages may actually have been too short for what I had in mind here, but I think it still works. I just loosely mapped out the arc of the story in my head and jotted down certain moments in the margins of the pages that I wanted to see, knowing that it needed to culminate in a stampede by page 4. If I'd had more time and space I would have liked to start the story with Sadie inside the outpost, making herself some tea before going out. 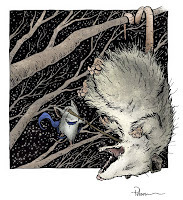 David: In terms of format, you seem to work in opposite layouts, either more vertical with your mainstream work, or horizontal for your Abominable Charles Christopher strip. This project had you splitting the difference with a perfect square. Was there any difference to your storytelling or layouts in the format? Karl: It definitely forced me to think about my layouts differently. I like to use a lot of 'widescreen' panels when possible - page-wide panels that allow for landscapes and long pauses in reading. But with this square format it was tough to do that while still being economic with the space. I wanted to stick to the aesthetic you'd already established, otherwise I might have used more inset panels here and there. But I like that the end result is clean and uses the whole page in a very even, geometric way. David: With a layout ready, how to you move on to the final artwork? David: What size did you do the final art? And using what supplies? Karl: These were 12" by 12" on Strathmore Bristol. I used a blue pencil to do my drawing and inked everything with a Staedtler pigment liner and a Pentel Brush Pen. 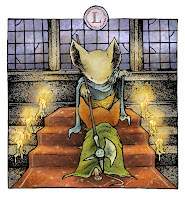 David: The colors on Charles Christopher is all done in a pale green/grey tone, so even though I shouldn’t have been, I was surprised when you turned in your colored Legends pages as they were full color. Did you ever consider using a limited palate? or has this project made you think about introducing color ever to Charles’ neck of the woods? Karl: This story was a bit of an experiment for me in that I could see what Charles Christopher might look like if I were to colour it with a more diverse palette. It's something I couldn't and wouldn't do in the strip because A) I don't have enough time to do it weekly, and B) it's no longer appropriate. 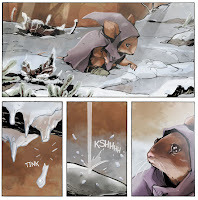 I think the limited palette on Charles Christopher gives a dreamy, otherworldly felling to the comic that full colour would take away. Everything would seem too 'literal'. But it was fun to do here. David: What process do you use to color? Are you a tablet guy? Karl: Yeah, I do all my colouring in Photoshop using a Wacom tablet I recently bought a Cintiq tablet so I'm eager to see how my process changes now that I can draw directly on the screen. I also use WAY too many layers. David: Where can people find out more about Karl Kerschl and your work? Karl: I have a blog and gallery at karlkerschl.com, but most of my online presence is centred around The Abominable Charles Christopher, which updates weekly at http://www.abominable.cc/. Karl's Story "Bowen's Tale" is in Issue 4 of Legends of the Guard and collected in the recently released Hardcover collecting all 4 issues. 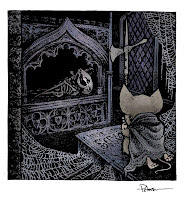 David Petersen: Craig, I have told aspiring artists before that there are two kinds of artists out there, those that love telling other people’s stories with other people’s characters (like Marvel or DC) and those that simply must work on their own projects. You have a foothold in both sides of my model. 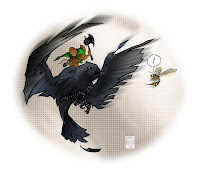 For that reason, was it fairly simple to slip out of your other work to jump in to Legends of the Guard? Craig Rousseau: Simple answer, yes. 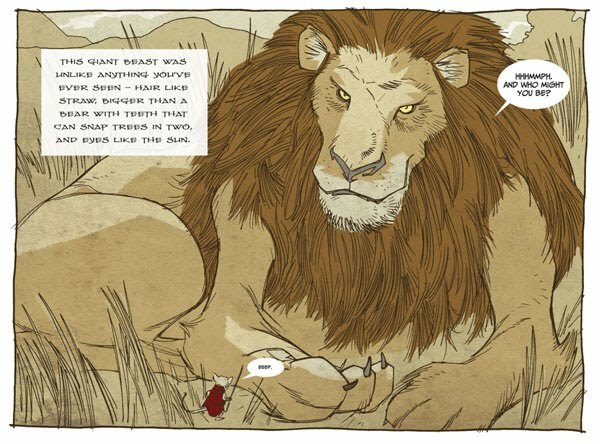 David: Your story: ‘The Lion and the Mouse’ is a retelling of the Aesop’s fable. 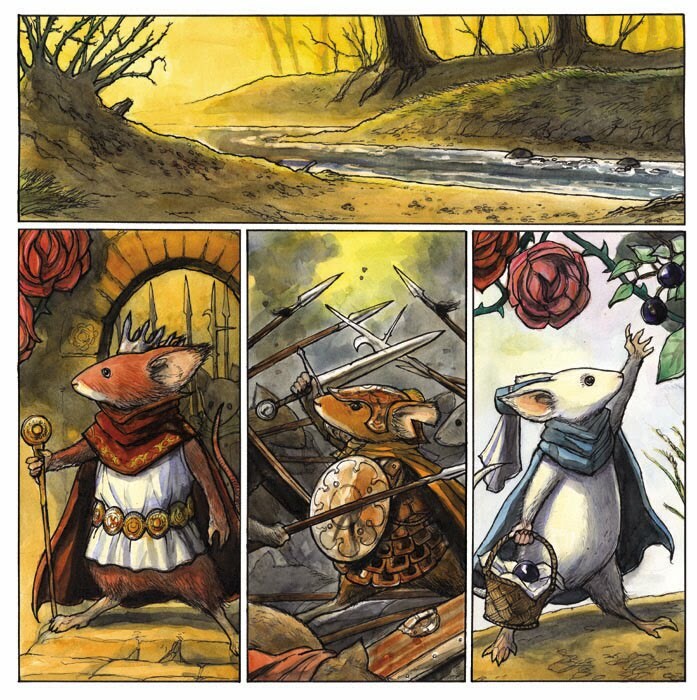 What resonated with that story for you to do a Mouse guard retelling? 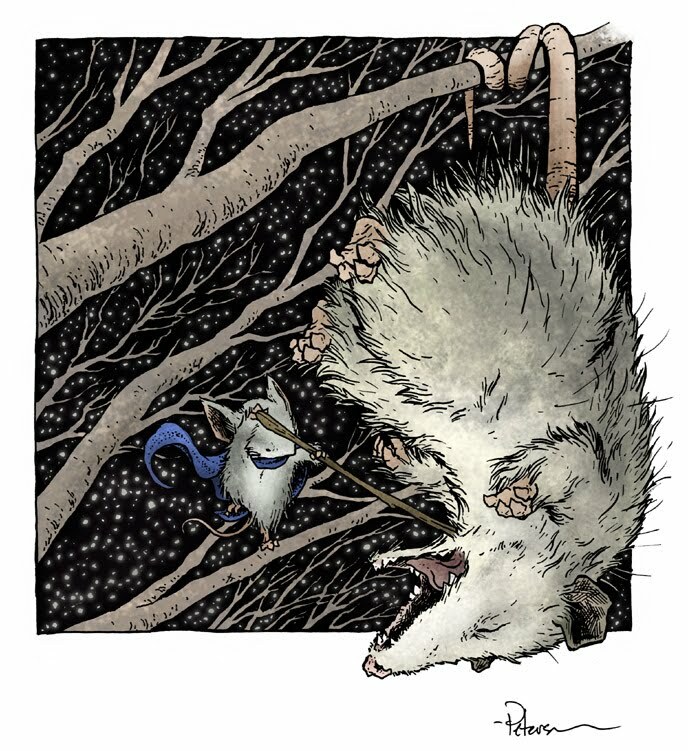 Craig: Well, I knew the story obviously needed a mouse protagonist .... and trying to figure out what I wanted to draw, immediately I thought of that fable. 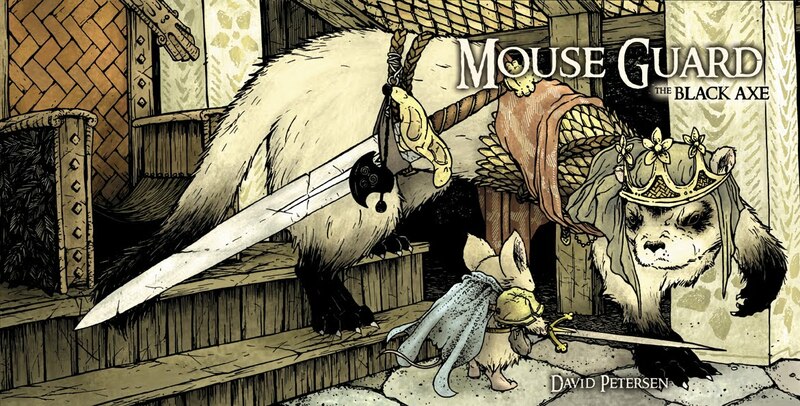 David: When we wrote the series bible/guidelines for the creators, one of the points had to do with keeping the animal species and location much like my Mouse Guard stories (where I use my home state of MI as a guide). however, I was open to creators who wanted to break and bend the rules. 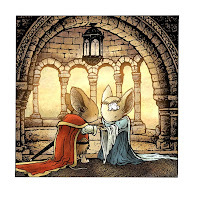 Did you find it difficult to take the story outside of the normal settings and species and still make it feel Mouse Guard? Craig: See, I know we had a conversation about this via email back when I had the idea... but to be honest, I only JUST found the bible attached to an earlier email you sent (and STILL haven’t read it)... I knew the framing sequence would allow some flexibility, and the idea of a story passed along from generation to generation, across continents becomes a “legend” of a sort. 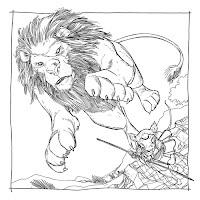 I particularly liked the idea that the story had traveled so far and a lion would be a fantastical creature and Africa like another world. David: With your book Perhapanauts, the co-creator Todd Dezago handles the writing. For this project you acted as word-jockey as well. Was that something new for you? And did you find it to be difficult or a breeze? David: Lets talk about art process. 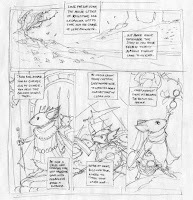 Do you thumbnail your layouts as you are writing the story? Or do you have an outline first? 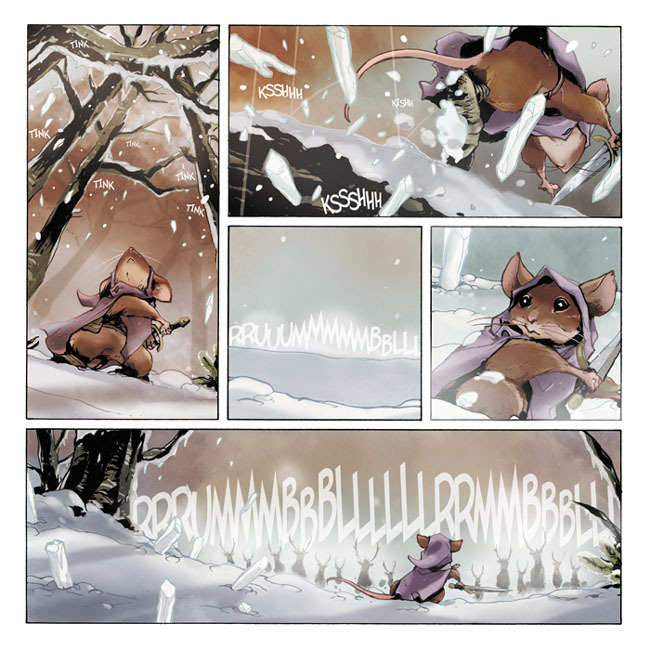 Craig: Being the first story I’ve actually written, I went with my strength and started with an image (that last big panel on page 2) and worked it out in both directions from there. From there, I had a rough plot breakdown in my head and started laying out the pages. David: Once you have your thumbnails, do you enlarge them or transfer them to your final working size? or do you just use them as a sight guide and redraw at the full size? Craig: At this point in my career (crazy to think how long I‘ve been doing this... and how many pages I’ve turned out over the last 14 or so years), I thumbnail the pages in my head and go straight to the boards. David: Your inks are a defining ‘Rousseau’ style for me. 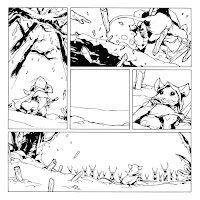 I read in a comic art magazine "Work on line weights, only a few people like Craig Rousseau can pull off not using any" Where did your finished line style come from and what tools do you use to achieve them? Craig: Even though I’ve never really working in animation (beyond dabbling in storyboard work for Walt Disney Television animation a few times), over the years I’ve done quite a bit of work on animated properties for publishers... and one defining aspect of most animation styles is a very consistent line weight and tried to work that look into my ink. I’d also been trying to break down my work into the simplest drawings possible, using that one “right” line rather than using 20. Oddly, with my next Marvel project, i started inking heavier lines and spotting blacks to mix things up (it’s been years since i’ve done it), but i’m still using only Faber Castell Pitt pens (S for super fine)... for the Perhapanauts i’m still using a more open line work. 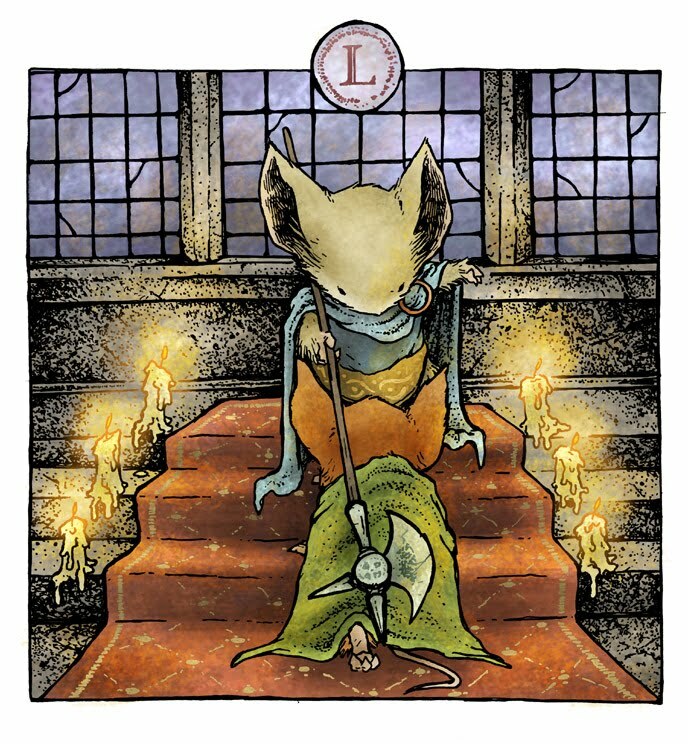 David: How did you color your pages for Legends of the Guard? And where did your color choices come from? Craig: All the color work was done in Photoshop CS4. I tried to keep the palette very simple with minimal shading and highlights (and added a subtle aged paper texture to the art in a semi opaque layer). 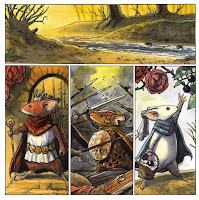 The mouse’s garb is based on the Massai warriors of Africa and i wanted to keep that the most vibrant element in the art (being so small, I needed the mouse to stand out) and wanted those golden, earthy tones throughout. David: Where can people find out more about Craig Rousseau and all your various projects? 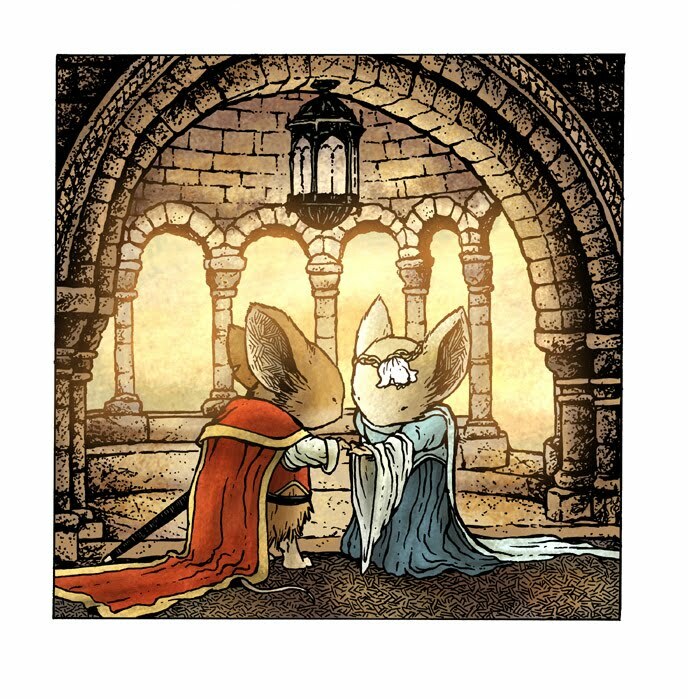 Craig's Story "The Lion and the Mouse" is in Issue 4 of Legends of the Guard and collected in the recently released Hardcover collecting all 4 issues. 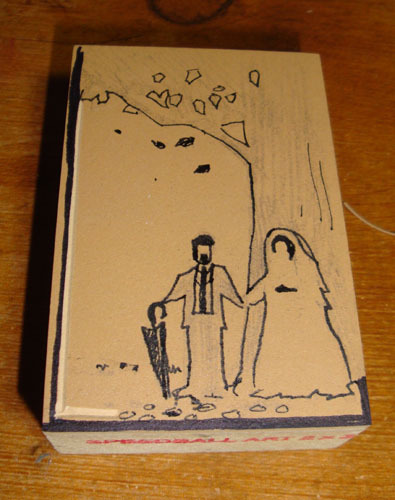 For the hardcover collection, I asked Portuguese artist Joao Lemos to do an epilogue. Instead of a typed interview though, I asked him questions and talked with him about story, process, and his past works on Skype. Here in two parts, is my interview/conversation with Joao. I appologize that Joao's audio is fuzzy, it is a fault of my recording set-up. 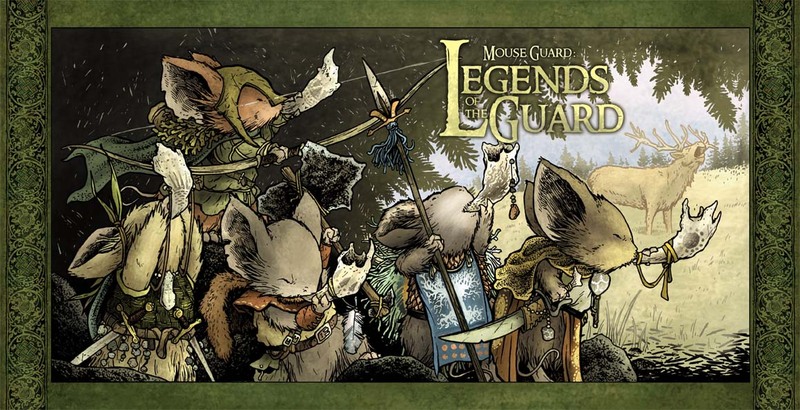 The Legends of the Guard hardcover collects issues 1-4 of the Mouse Guard spinoff anthology series and is available tomorrow 11-17-10. In addition to Joao's epilogue also features a cutaway of the in, map of the territories, a guide to the characters, cover gallery, and a contributor section with bios and sketches. It is available at your local comic shop and major book sellers. David: This project started as a comment I made to you an Jeremy after you turned in your awesome pinups for Fall 1152 (because of that, I bookended the series with your two stories). 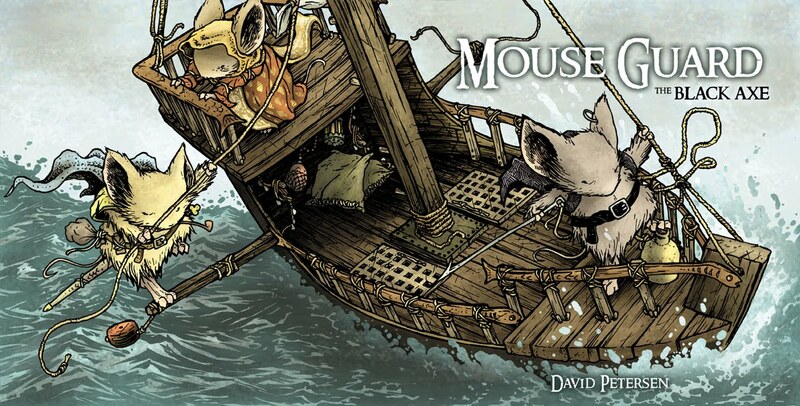 As both a creator on the series and a decision maker at Archaia, did you have any idea when I mentioned that you and Jeremy could "play in the world of Mouse Guard whenever you wanted" we would be 4 issues in to an anthology series? Mark: No, it’s been very nice to watch this project grow from that random conversation into an amazing anthology. Conversations and ideas like that all too often fall into the “that’s nice, but it’ll never happen” category, so both as a publisher and as an artist it’s fantastic when a great idea that’s kind of casually batted around then grows into an actual published work. David: When you submitted story ideas, there were three to choose from. 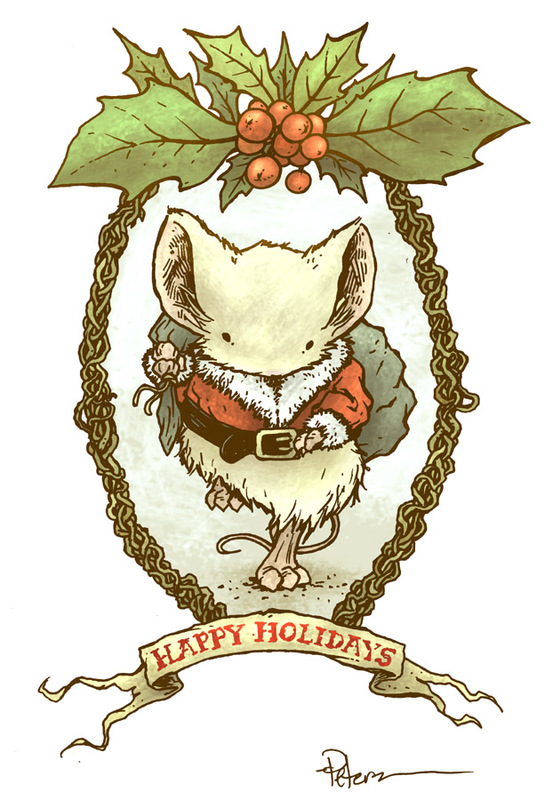 I picked one because I thought it felt the most ‘like you’ and because you would be drawing mice in armor. Tell folks about your story and talk about how you developed it. 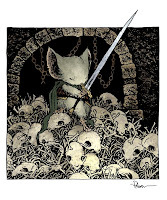 Mark: Oddly enough there’s not necessarily a lot of mouse armor in it, at least not in comparison to Jeremy’s take on mouse armor. 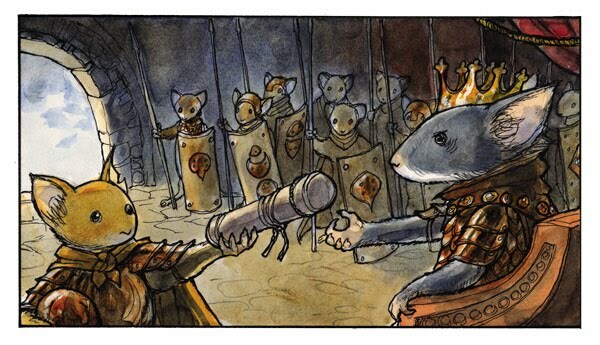 For this particular story I had been inspired by the cover of LEGENDS #1, with the two mouse kings fighting each other on the bridge. 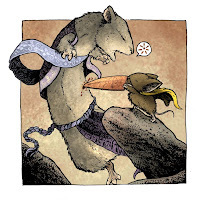 I thought a bit about what the history of mouse war would have been like; given how many predators and natural dangers there are for them, inter-mouse war would seem pretty rare, but clearly (as we saw in FALL 1152) the Mouse Territories have reached a point of safety and security that, oddly enough, opens up the option of mice fighting mice. So I thought about the idea of these two lineages squabbling with each other, generation after generation, and about some of the things that would motivate them to fight and do un-mouse-like things, and how that kind of vendetta war could come to an end. I wound up drawing from the story of David and Bathsheeba from the Bible, in which David sends his general Uriah the Hittite out on a suicide mission so he can marry Bathsheeba, and tried to put a Guard spin on it. David: With Artesia you are doing something I’m a real fan of: World Building. It’s a very complete place with culture(s), maps, & history. And you seem to be bringing that commitment to your Legends story as well. What went into making the cities and armor in your story and who are some of your favorite world builders in art and storytelling? Mark: Well, there’s a lot to work with already in the MG world. I took the name “Rosestone” to be kind of literal, and wanted to have a mouse town that combined both an earthy, underground atmosphere with these flowering roses everywhere. And since the events of the story are supposed to be happening at some point in the past, I tried to take the medieval flavorings of the current MG series and work backwards a bit, so hopefully there’s an early medieval, Romanesque feel to the armor and “costumes” (for example, Moira’s bonnet, the legionnaire shields that the mouse soldiers use, etc.). I think there are a lot of great world-builders out there to be inspired by; beginning with Tolkien’s Middle Earth, of course, but Robert Howard’s Hyboria, Lloyd Alexander’s Welsh Prydain, Roger Zelazny’s Amber, Robert Adams’ post-apocalyptic Horseclans novels, Glen Cook’s Black Company books, George Martin’s Song of Ice and Fire, all of them have awesome fantasy settings. Same with fantasy RPG settings like Greg Stafford’s Glorantha and Bob Bledsaw’s Wilderlands. For visual worldbuilding you can’t get much better than James Gurney’s Dinotopia and Rien Poortvliet’s Gnomes. David: You and I are both fans of paper modeling, but what other real world techniques do you use to try and build a world as real as you can make on paper? Mark: I use some plastic models of men in armor (there are some Japanese companies that do historical plastic model kits, for example), and have a few reproduction weapons and helmets, but a lot of it is book research: just trying to read as much as possible about the history of culture and technology, look at lots of pictures of real places and objects and costumes. David: With your process, how do you take an outline or story description and break it into pages and panels? Mark: The words are first, at least most of the time, and tend to dictate for me which panel is coming next, where the characters are positioned, etc. I break down the script of the dialogue and story actions, grouping them into beats, then thumbnail the pages and panels to see how it’s all going to flow, how much can fit into each page, whether material has to be cut or stretched out to make a particular page or transition work. David: You did a pinup for me on the square format, but this is your first time doing panel by panel storytelling in it. Did you find it very different from how you lay out a traditional page? Mark: The basics are still the same. 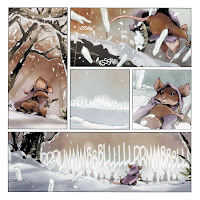 The square format definitely changes things subtly; like when you do wide panels, they’re very wide, almost cinematic. 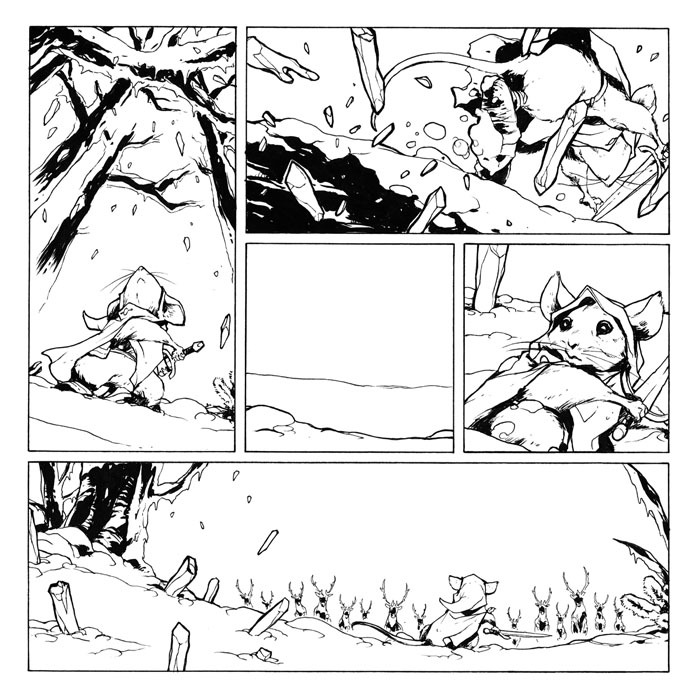 I tried to give this particular story a little bit of a fairy tale quality, so the panel selection was fairly simple, nothing too complicated (which always feels more modern to me). David: Your final artwork and thumbnails match fairly closely, do you redraw the thumbnails on your final surface? 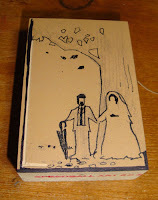 or do you transfer them somehow using a lightbox or blueline printing? 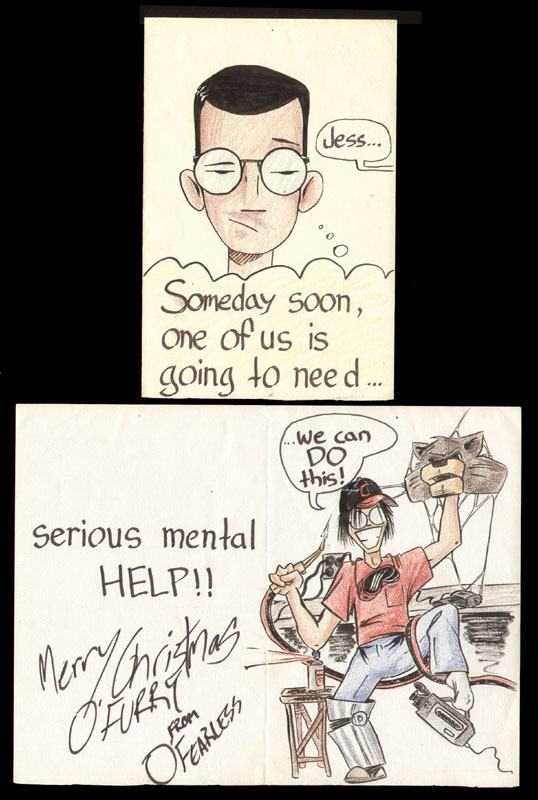 Mark: No, I do the thumbnails on spare typewriter paper. I’ll have them nearby as reference when I’m doing the actual penciling, but I generally don’t use a lightbox even though I have them available. 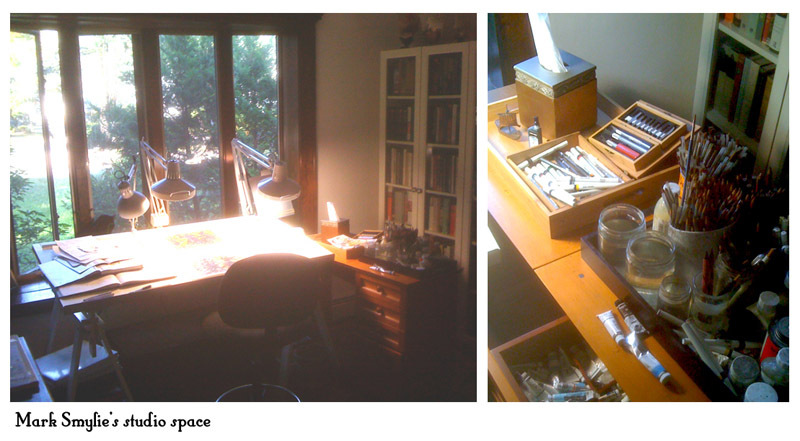 David: Your work is all hand painted using watercolors and gouache. What brands and materials do you use (paints, paper, brushes)? Mark: I pencil and paint onto Strathmore 500 2-ply Bristol plate, sometimes 3-ply; I usually buy it by the sheet and then cut to the size I need. 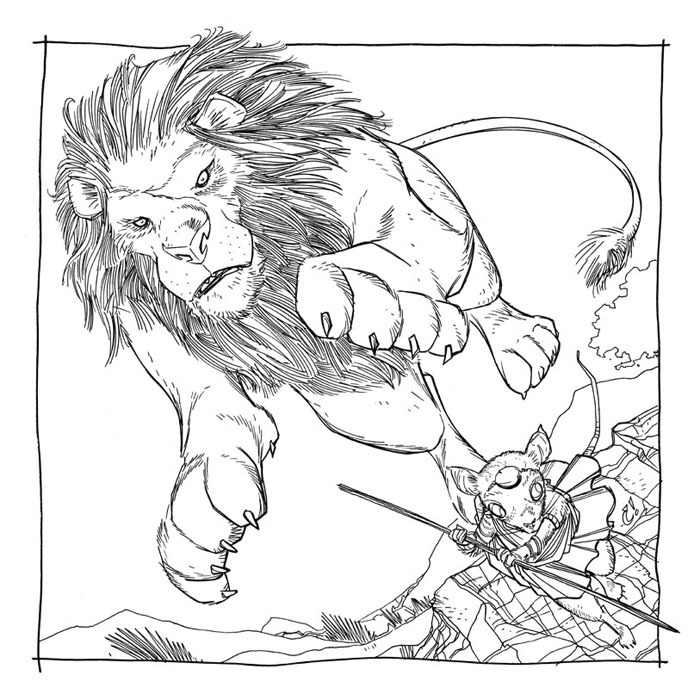 Though for the LEGENDS pages I think I used a pad of 14x18 2-ply Bristol plate. It’s not really suitable for watercolor painting, but I like to ink on the plate surface. I use a variety of watercolor and gouache brands; Windsor & Newton, Sennelier, and Old Holland, mostly, with an occasional Grumbacher Academy. I often use Wilcox’s Guide to Watercolor Paints to pick a brand for lightfastness and pigmentation. I use a bunch of different brushes, mostly sable, from industry standard Windsor & Newton Series 7 No 2s and Rekabs to brushes of uncertain origin that I just happen to like. There’s a lot of detail work so I don’t tend to use brushes with big heads, they’re usually size 2-8. David: What is the process for painting a page? Do you ink first and paint second? How long do you spend painting vs waiting for paint to dry? 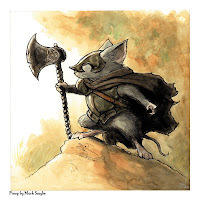 Mark: I paint directly onto the pencils, then ink afterwards; then usually do a second pass with paints, and then finish with another round of inks and colored pencils. Watercolor dries pretty fast, which is both good and bad, in that it doesn’t give you much time to correct mistakes. Other watercolorists work differently; Mike Kaluta, for example, inks first and then sprays a workable fixative to fix the inks, and then paints on his inks. David: Where can people find out more about Mark Smylie and Artesia? 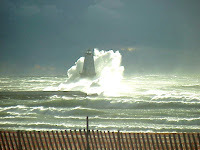 Mark's Story "Crown of Silver Crown of Gold"
My Dad was in a blustery Ludington last week where locals say they can't remember having winds so strong. The gusts were as strong as fifty miles per hour and lasted for two days straight. 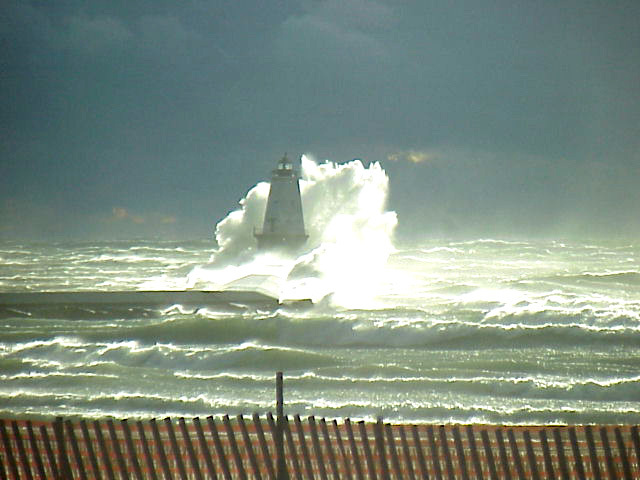 Dad drove down to the lake front and snapped a few photos (including this one) of waves hitting the breakwater and lighthouse. He said getting out of the car was painful as the beach was being sand-blasted at you. I think this photo is a wonderful example for people who have never been to the Great Lakes and hear the word 'lake' and think 'pond'. Lake Michigan is so wide, you can't see the other side because of the curvature of the earth. Storms on the Great Lakes have taken down ocean going vessels. This lake is closer to an ocean experience with the added bonus of no creatures that can eat or sting you. Panels for Primates:Troy Wilson edited a charity webcomic anthology hosted by ACT-I-VATE to benefit Primate Rescue. 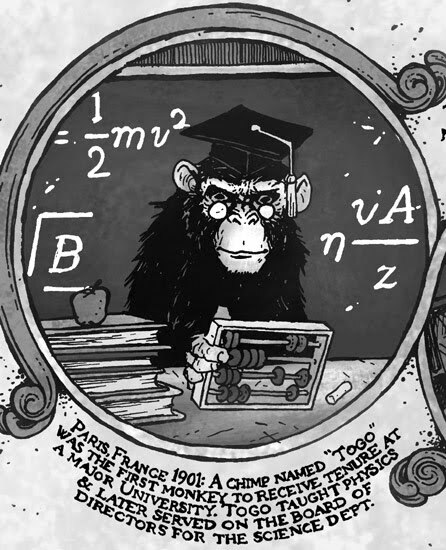 I contributed a one page story called 'Great Primates in History' which is a farcical accounting of four primates and their effect on history. My story will go live here tomorrow. Tomorrow, Wed. Nov. 3rd, Jeremy Bastian, Nate Pride, Katie Cook, and I will be signing Legends of the Guard issues and the collected hardcover at Green Brain Comics in Dearborn, MI. I know this is short notice, but if you are in the area, please stop by between 4pm and 7pm to say hello and/or get your book(s) signed. 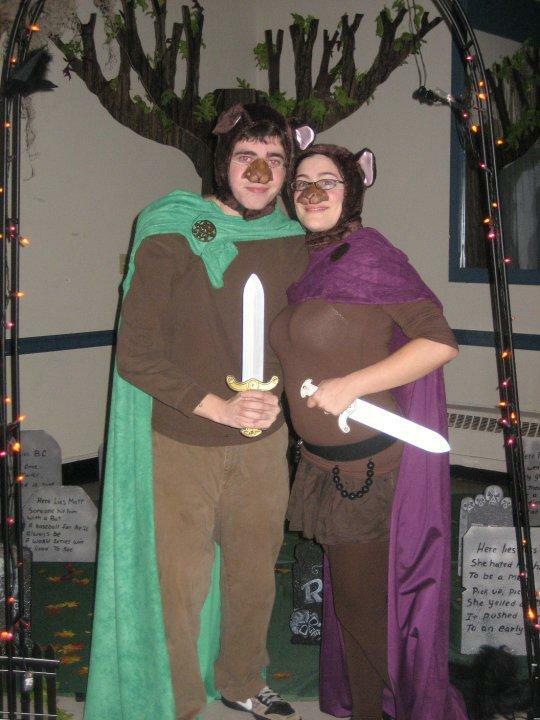 Jeff Hendrickson send me this photo of he and his girlfriend in their Halloween costumes as Lieam and Sadie. Thanks for sending it in Jeff!